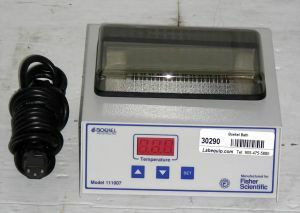 Product Description The Boekel digital dry bath incubator has a large, easily readable LED display and is a reliable, economical and convenient incubator for conventional microtube and test tube heating applications as well as for enzyme kinetics, restriction digests, coagulation studies and in situ hybridization. Proportional integrated controller provides easy temperature selection, rapid heatup and superior stability. Temperature can be set in 0.1C increments from 5C above ambient up to 99.9C and in 1C increments between 100C and 120C, with temperature uniformity of +/-0.3C at 37C. This is a Hot Start PCR model which has a permanently fixed 96-well microtube block (accepting 0.2mL conical tubes, tube strips and 96-well plates) and an acrylic plastic lid.